That a recipe could be attributed to my father, and circulated for decades among relatives and friends, is something that astounds me. I found it this summer in a cookbook belonging to my Aunt Ann. To be fair, I do remember my father making it–once–for the neighborhood block party, celebrating the end of summer, 1975. We had just moved into the duplex on Connor Road where most of the Captains and new Majors were housed at West Point on the Hudson. It was the summer my mother left to live with family at the shore. For a couple months, my physician father was forced to be both provider and parent–the latter a role he had never fully filled. I still have that big brown wooden bowl which is usually filled with popcorn in my home, as it often was when I was a child. 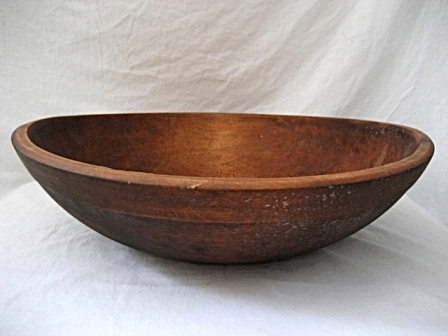 The bowl belonged to my Nana Lila–who was a well known cook–and perhaps it was from her that my father inherited this renown family recipe for Caesar Salad. Fran was tall, vivacious and spunky, and although I was only fourteen when she and my grandmother lost their lives, the playful quality of their mid-life friendship colors my life to this day. Among the joys Lila and Fran shared was a delight of good food and cooking. They worked as caterers together. Their passion lives on as generations of loved ones share their favorite recipes. This recipe is for something as simple and fun-loving as Auntie Fran. It’s one that gets requested each time it’s served.